Drills include up to five Draculas. 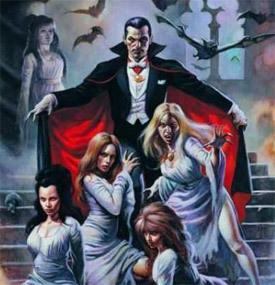 Brides of Dracula no longer included due to complaints about gauzy outfits. 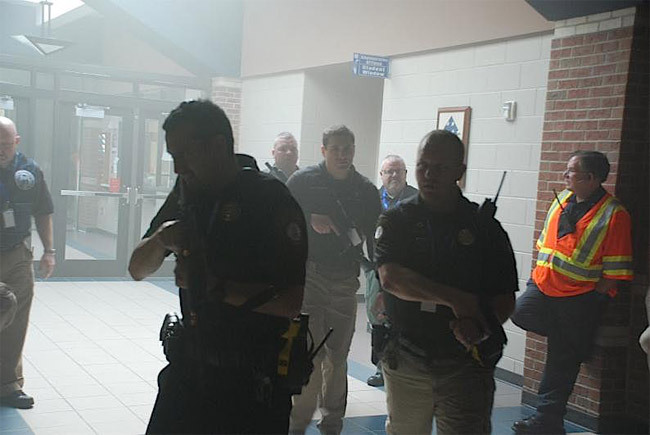 The White County Sheriff's Office is here to help prepare students, teachers, faculty, and community members for the eventuality of an active shooter situation. You will need to learn how you react under the pressure of imminent death. That means the only way to truly prepare for this sort of situation is to experience true bone-chilling terror. Now, since we are no longer allowed to perform mock executions with BB guns due to some complainers, we have developed an alternative plan to allow you to experience active shooter level terror. The White County Sheriff's Office Now employs five actual Draculas to terrify your staff. These Draculas will simulate an active shooter by menacing you with Dracula death. They will mist form, they will jump up on the ceiling like a bat, they will flash red eyes at you and hypnotize you, and they will drink your blood. We are going to have teachers get into a coffin with a Dracula one at a time. This is the equivalent to our hostage situation execution drills. But it's not just about being afraid, it's about fighting back. We will teach you how to fight off an active shooter by using your superior numbers. You will throw books and backpacks at him. You will rush him and try to make him so full on human blood that his reflexes are impaired. No garlic or crosses will be permitted in this situation folks. Keep in mind, these are not Draculas for the purposes of the simulation, these are active shooters. And we are sheriffs so if you get mad about being bit by the Dracula and you try to fight back we will kill or arrest you. We understand that some of you may think a Dracula is unholy. That a blood-eating deathless night stalker is not appropriate for a high school campus. Well, A, you are incorrect, but B, we have recently hired two wolfmans and we have a part time actual Egyptian mummy. We can now run full moon active shooter scenarios and ancient cursed active shooter scenarios. Opening a forbidden crypt in your school? Mummy is ready. Doing it on a full moon? You could need both wolfmans and mummy. We can run a combo scenario to train for active shooters with any combination of wolfmans, mummy, and Draculas. Depending on if that last police bond passes we also have some other scenarios in mind to prepare for active shooter. Lagoon Creatures - Great for a school or business with a water feature. Aliens - In space no one can hear the active shooter, which is why you need to be prepared for every eventuality. We have purchased the eggs already, just looking for a host. Ghosts - This active shooter is going to bust and it will make you feel good (terrified). Frankensteins - Still working on this one. We have hooked Fentanyl ODs up to car batteries and have some promising results, but nothing yet. Jasons - Stomps around very similar to an active shooter. We are in contact with a supplier of premium grade summer camp Jasons that will stalk faculty and students tirelessly. Freddies - The nightmare of active shooters is coming to life and it might just look like a tongue coming out of a telephone to lick your ear. Please keep in mind that some injuries may result during active shooter drills. Your children might suffer from Dracula bites, the faculty has a small chance of contracting lycanthropy, and teachers might just be stalked by an indefatigable Egyptian corpse king in search of his lost canoptic jar. We are professional sheriffs, not maniacs, so we will do everything in our power to not let the Draculas eat all of your blood. Thank you for your understanding. Our only goal is prepare you for active shooter scenarios and we promise we are not sadists or maniacs. The Lamest Super Heroes of "Heroes Unlimited: The Justice Machine"
Let's talk about sleep paralysis.